Are The Planets Just For Decoration? is fantastic reading filled with amazing insight and intuitive mastery. ProsperityJoy’s fantastic rendition of the metaphysical link between astrology, the planets, and our lives from birth to death (with spiritual steps to conscious awareness of each sign) will have you mesmerized. If you’ve been asleep to the world around you, this book is sure to wake you up. What’s more, the author has managed to condense this knowledge into roughly 107 pages. A short read that’s worth every minute! This is the first in a series of forthcoming books by the author on various topics that you won’t want to miss! My decision to write a book about astrology and its link to metaphysics did not come overnight. I studied astrology for many years (though I do not consider myself an astrologer per se). Along with my astrological studies I began to comprehend the ligature between the planets and our spiritual existence. As I grew in consciousness I "realized" that everything has a purpose and that there is "no-way" that the planets are simply floating in space for our entertainment. This is a very intelligently designed universe and all entities influence one another. The Creator of this universe is the ultimate environmentalist. Nothing goes to waste! Everything has a purpose a "time and a season." Anyway, I felt the need to share my knowledge and inspiration with others and voila...Are The Planets Just For Decoration?" was born. My book is not filled with complicated charts, complex timetables, and elaborate hieroglyphs. 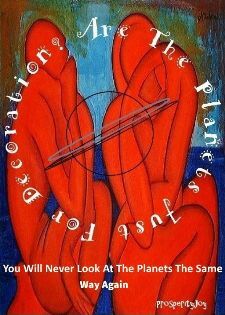 It's a simple easy to read erudition about the planets and the 12 steps of our spiritual earthly journey. All of my future books will be written about different topics based on metaphysical themes.